The attack happened Saturday night, police said. GREENPOINT — A group of men robbed and slashed a stranger inside McGolrick Park after he tried to return a pack of cigarettes one of the men dropped, police said. 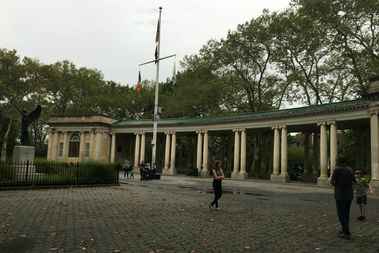 A 27-year-old man was inside the Greenpoint park Saturday night at 9:30 p.m. when he noticed a man drop his cigarettes and went over to return them, he later told police. But the group of men who he'd approached him accused him of following them and began attacking him, according to police. "Are you following us?" the men asked, police said. "What are you looking for." One man then smashed the victim's head on a metal bar. A second pulled out a large knife with a black handle and slashed him on the left side of his face, police said. They stole his iPhone, a bracelet and $250 cash and ran off, according to police. It wasn't immediately clear if the man was taken to the hospital for his injuries. No arrests had been made as of Sunday night, police said.